Well, this was an interesting race. 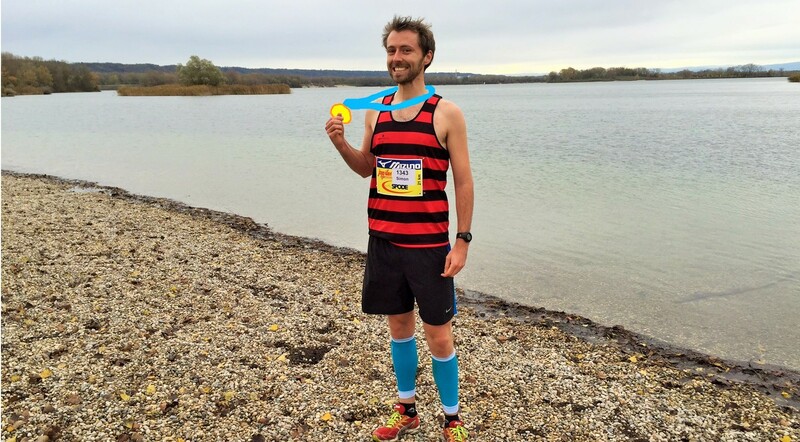 I had been looking for a while for a weekend race for an excuse to go back home to Lyon, in France, and stumbled upon ‘Joggiles’, a fairly straight forward half marathon around the Lac Miribel, on the outskirts of the town. On paper and in practice, it was a fairly ‘village fete’-like but well-attended race. 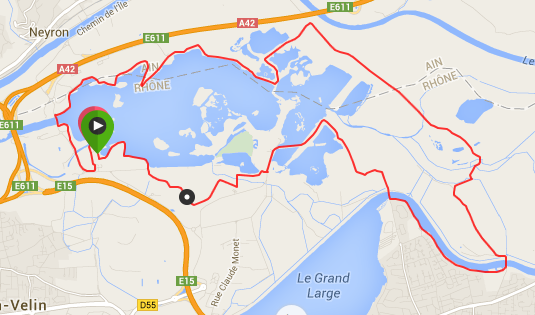 The course was fairly straight forward: a counter-clockwise loop around the lake along the gravelly paths. What I hadn’t expected mind you was the 8 inches of rain in the previous two weeks which transformed some ‘gravelly’ bits into ‘mud-baths’ but more about that later. As in every race that I do, I (stupidly?) set off like an arrow. “Unfortunately”, there are no photos of this because, erm, my friend Arno went back to the car for a nap after he dropped me off and slept through the start! 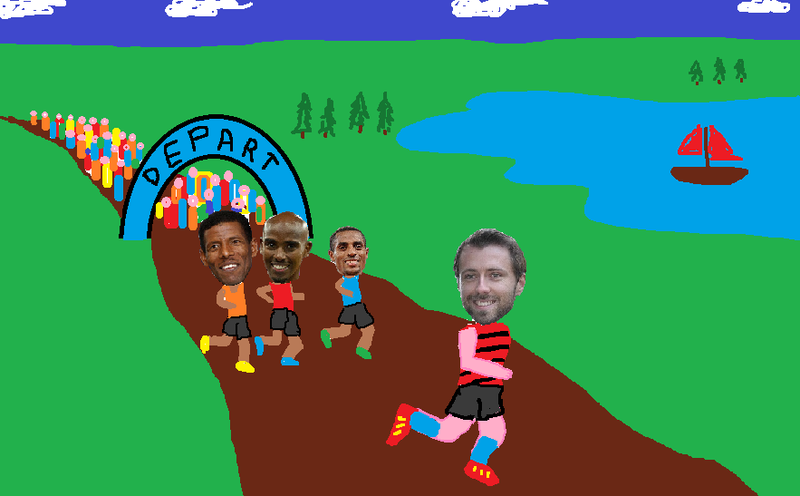 Without photos, this race shall therefore be illustrated using the art of … Microsoft Paint! Enjoy. It was just as well I set off so quickly as you hit a sharp and narrow corner after about 300m which was at lake level on the cobbled beach which was just pure mud and water. As I was at the front, I could run through without slowing down too much but it must have been an absolute beach of a traffic jam (that’s a terrible pun…) for anyone at the back. Although it was slowly but surely disappearing, I maintained my lead for the first 4km. This was until I hit a cross road where the seemingly obvious option was to carry on straight. The marshal blocked the traffic by standing like a lollipop man to my right which reinforced my opinion that I should have gone straight. Apparently not. I ran for about 5 seconds before I heard the guy in second place shout out at me that I should have turned left! “Sacrébleu” as Brits might think I’d say or “Bordel de putain de merde” as I more accurately said. I spun around as quickly as I could and, gracefully, the new leader suggested he’d wait for me to catch up but I told him to run away as he was clearly a lot faster anyway. I meandered along the rest of the race through rows of poplars and fields of potatoes at a decent pace for this course all the while undeniably being overtaken at a steady rate of 1 person per km: the perils of setting off like a hare. Speedwise, I hit the 5km on 19min and 10km on 39min which was decent. As I ran along, the odd “Bonjouuuur” from Sunday walkers was inter-mingled with the odd glare from terrified dogs as we ruined their quiet morning sniff and poo. At times, the course was only 10-15cm above the lake level so it was probably a good thing it only rained 8 – not 9, inches previously! 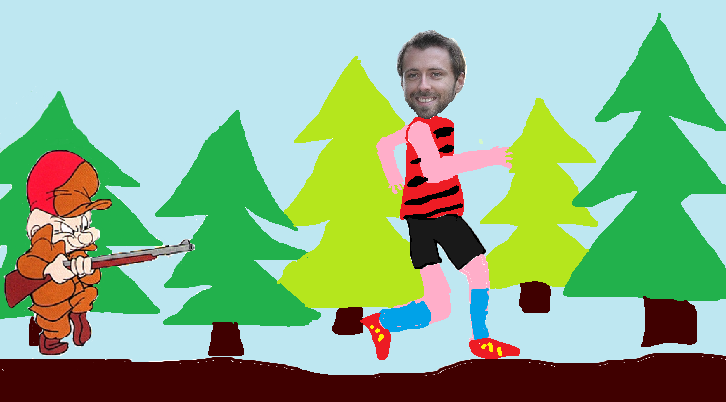 It was also a good thing that I was dressed like a mix of Dennis the Menace / a Christmas tree as hunting season was still going strong on the outskirts of the park. Apart from the odd gunshot in the distance, I was fairly unaware of their presence until, after around 13km, we ran past an Elmer Fudd (the Bugs Bunny hunter) lookalike who was casually staring at us with his gun over his shoulder, probably thinking that we would be good aiming practice. Wun wunner, wun! It was around this point that my hip was getting more and more sore and an inconvenience (a remnant from Berlin marathon). It was also around this point that I gained a place by … not really doing much. At the time, I was in 8th place, 10 metres behind a group of 3 and 30 metres behind the runner in fourth. We reached a T junction and the runner in fourth turned right. We turned left. We were right. He was wrong. We were shamefully quite happy. He probably said “Sacrébleu”. We ran on. I spoke to him after the race and he said he only noticed his mistake after 2km before he turned around! However, he did say he finished 2nd last year when he should have been 4th because the first two runners got lost towards the end of the race! You’d think they’d at least put arrows up if it happens every year. After that, positions didn’t really change much. I picked up a bit of speed in the last few kilometres and overtook two runners in the last 500m. After a final sprint, I finished under the dulcet tones (ish) of a brass band a few seconds short of fifth place (which made my wrong turn earlier in the race a little more frustrating!). By this point, Arno had woken up and was there to greet (and film) me. Although advertised as a half marathon, the run was just shy of 21km so my PB of 1h21 was a bit meaningless. They also messed up my chip and recorded me as finishing tenth last in 2h27 – the bastards! All in all, the run was, erm, rural. Probably the least well organised one I’ve done so far (and there were no medals either!) but it was a good result, and my hip didn’t break, which was definitely a good result. The less said about the odour coming from my muddy shoes after the race, the better. This was my last race for 2014. I’m getting there, for sure, although the last two races have felt a little bit like being the eternal bridesmaid in fourth position so…bring on 2015!